SHOULD THE POLICE BE ATTENDING YOUR MEETINGS? YOU HAVE A LEGAL QUESTION? CALL-IN TO GET SOME FREE ADVICE! CENTRAL FLORIDA, SPACE COAST AND TREASURE COAST --- HERE WE COME! NOT ALL BANKS ARE THE SAME! WHAT IS THE REAL COST OF BORROWING? PROTECT YOUR HOME: WITH KNOWLEDGE! IF YOU ARE AN HOA, THE DPBR IS NOT A RESOURCE YOU CAN USE! 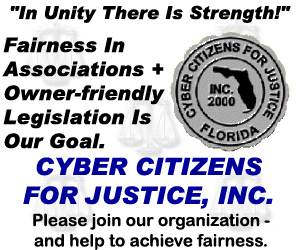 community association law and is the owner of Glazer and Associates, P.A. an eight attorney law firm in Orlando and Hollywood. For the past two years Eric has been the host of Condo Craze and HOAs, a weekly one hour radio show on 850 WFTL. He is the first attorney in the State of Florida that designed a course that certifies condominium residents as eligible to serve on a condominium Board of Directors and has now certified more than 6,000 Floridians. He is certified as a Circuit Court Mediator by The Florida Supreme Court and has mediated dozens of disputes between associations and unit owners. Finally, he recently argued the Cohn v. Grand Condominium case before The Florida Supreme Court, which is perhaps the single most important association law case decided by the court in a decade.